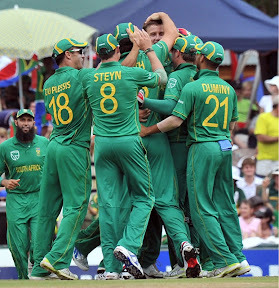 The South African Proteas finished off the thrilling One Day International Cricket series against India in style today at Centurion finishing the series 3-2 up. The match was slightly affected by rain when South Africa was batting in the first innings. South Africa's batting line-up collapsed in dramatic fashion when the players came back on the pitch after the forced break. With Duckworth and Lewis joining us again, the total for India to chase was 268 runs in 46 overs. Opening bowlers for the Proteas of Steyn and Tsotsobe started off well picking off the top order Indian batsmen. But Pathan came in to bring the required run rate to below one run per ball. Still, it was not enough after a massive top edge dismissed him for a well played and exciting 105 off 70 balls. Even though SA won the series 3-2, it wasn't as convincing as it could be. The battling lineup generally fails early on, which then has to be picked up by the upper middle batting order. More often than not, though, the lower order gets out much too cheaply. The crazy run-outs throughout the five matches from both sides have just been ridiculous. At this kind of level, you cannot give up wickets so pointlessly. Nevertheless, it sets up a great 2011 Cricket World Cup which will take place in the sub-continent in just a few weeks. It's been great entertainment to follow my home team play such exciting cricket again!